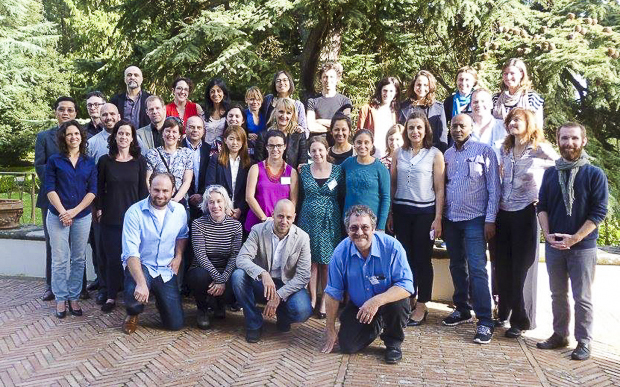 On April 5-6, over thirty scholars from all over the world gathered at the European University Institute in Fiesole in a ground-breaking event on human smuggling scholarship. The workshop – “Critical Approaches to Irregular Migration Facilitation: Dismantling the Human Smuggler Narrative” – was co-sponsored by the Migration Policy Centre at the Robert Schuman Centre for Advanced Studies and the National Security Studies Institute at the University of Texas at El Paso. The event reunited the most innovative and critical voices in contemporary academic and policy circles, and served to re-energize and advance a body of knowledge that despite its importance in present global population flows had remained dormant. Organized by Dr Luigi Achilli (MPC) and Dr Gabriella Sanchez (NSSI), the workshop had a series of goals in mind, starting with that of jumpstarting the contemporary global smuggling studies agenda through the creation of an interdisciplinary and international collective of researchers from the global north and south engaged in the study of migration facilitation. Yet it had an even deeper objective: to empirically ground a field of research often silenced by the onslaught of anecdotal evidence surrounding irregularized migrations, a discourse dominated by narratives of monolithic smuggling facilitators; of violence, exploitation and crime, and in which the state and its actions in controlling population flows are often described either as justified or as carrying ‘unintended consequences’ – a proxy for the disappearance and/or death of thousands of migrants and refugees in transit. The workshop took place at a critical time in migration studies, when despite the vast abundance of scholarship on the lives of migrants and refugees, grounded empirical work on the processes leading to their journeys and the effects and affects in them interwoven is still scant and scattered across the disciplines. The workshop aimed not only to be a platform to share findings or details on the operation of smuggling facilitations, but also to serve as a platform where scholars identified the analytical, theoretical and methodological limitations and challenges present in the field.